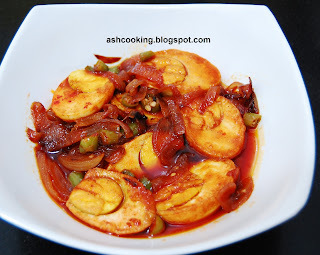 Egg Tomato Chatpata as my better half has named it is one useful creation that comes so handy during time constraint. "Chatpata" cause it is prepared within 10 minutes. While I was working, this one was added to our regular menu. Fatigued and tired from head to toe, when I used to return home from office, kitchen was the dreaded space I hated to enter. All I wanted to do at that time was to loll on bed and relax and have my food served on a platter. I missed my mother like hell then. She used to always keep my bag with tiffin and water bottle ready in front me when I used to go out to school. That thing didn’t change even when I started working. I never had to flick a stove on and delicious goodies were packed in tiffin box – luchi, alu dum, noodles, fried rice, roti with curry and the like. 1) Cut the eggs into two halves and fry them till they change color to orange. 2) Heat oil in a wok. Fry the onions till golden in color. 3) Add salt and green chillies. Saute for 1-2 minutes. 4) Mix the tomato sauce with half cup of water and pour it into the mixture being cooked. Stir around and simmer it for 2 minutes more. 5) Serve hot with rice.